Kieran O’Shea learns about Senior Technical Officer Les Craythorn’s career fascination with one of the world’s few operational Synthi 100 electronic modular synthesisers. One of a few original Synthi 100s in the world to have been restored to its original condition is about to have a reprise performance at the VCA. Sound master Les Craythorn has spent the past seven months restoring the vast modular synthesiser which is located in the VCA’s Electronic Music Studios. 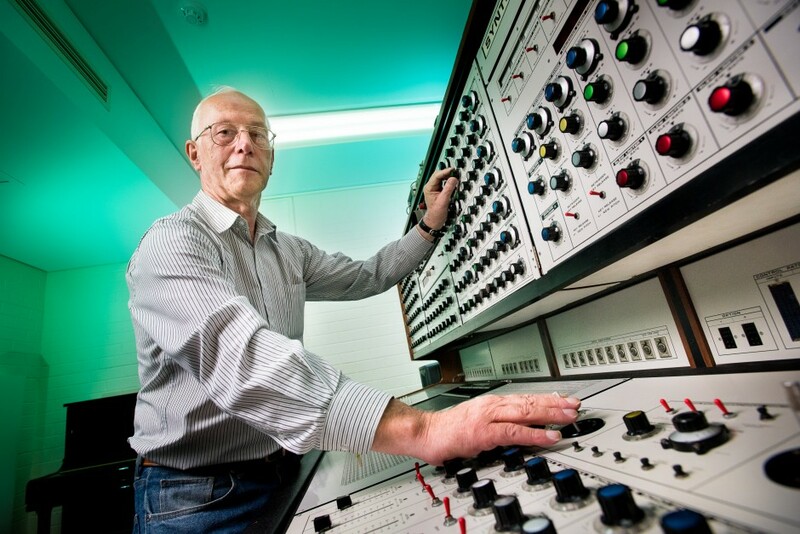 Mr Craythorn, who will be retiring in mid-June 2015 and has been working at the MCM since 1975, first came into contact with the Synthi 100 in 1975 when it was delivered to the University from London with the aid of a grant from the Gulbenkian Foundation. It became the centrepiece of the Conservatorium’s Electronic Music Studio allowing for forays into the electronic avant-garde music of the 1970s, “a time when electronic treatments of pitched and non-pitched music was developing, along with Musique Concrete techniques, which used the assemblage of various natural sounds to produce an aural montage,” Mr Craythorn explains. Mr Craythorn spent 12 creative years working closely with students and composers to create experimental electronic music. “I was experimenting with the machine’s extensive sonic capabilities, microtonal tuning and seamless glissandos that you hear demonstrated in Percy Grainger’s Free Music,” Mr Craythorn says. Late in the 1980s the instrument went into storage as people’s attention turned away from the warmth and texture of analogue, to the convenience of digital machines. After a condition report in 2013, the Synthi was found covered in dust with parts missing, circuit cars discoloured with oxide and widespread component failures. In July 2014 it was decided that Mr Craythorn would focus on a project to repair the Synthi 100. “I had to remove all electronics down to the wiring loom and individually remove each of the Synthi’s 84 circuit cards and 185 dials, cleaning them using specialty lubricants and an ultrasonic bath,” he explains. Mr Craythorn spent around 120 hours working on the restoration and the cost of spare parts was about $1500. This year he put in a further 80 hours refurbishing the 185 potentiometers. It has been only during the last year as he transitions into retirement that Mr Craythorn has had a chance to reflect on his career and the composers and their works that were produced on the Synthi 100. This isn’t the end for Mr Craythorn’s connection with the Synthi 100. There are tape restoration projects involving digitising analogue reel-to-reel tapes and a tutorial-style manual is planned. There is the Synthi 100 Concert on Friday 27 March during which Les Craythorn will demonstrate the endless sonic palette and complexity of the Synthi 100 through performances of compositions performed on the instrument including Peter Tahourdin and Percy Grainger’s rarely realised Free Music. The evening will end with Mr Craythorn performing an excerpt from the opening of Sirius by Stockhausen. Previous Previous post: After 30 years, can Neighbours and Australians become good friends?